I try my best to make Sunday dinners the best of the week. This Sunday, I fell flat on my face. While getting ready for church and thinking of my day I went to plan dinner in my much too busy brain. I quickly realized we had nothing good to eat! I don't go shopping on Sunday because I like to spend as much time as possible with the family. Running to the store was not an option. I chose to forget about it until we got home from church and then I'm sure I could com up with something to satisfy my hungry husband. Enter wife who always wants to impress her husband even if she fails! I told him to grab a snack and put on a movie because that would take some time. You can go to her direct site to view the recipe or check it out below! 1. Put 1/4 cup of bread flour on your clean counter top and reserve. Place remaining 3 3/4 cups bread flour in your mixer bowl. Spoon the yeast on one side of the bowl, and the salt on the other side. Pour in the warm water and with your regular mixer paddle, mix on low speed until the dough comes together in a mass. Switch to the dough hook. Mix on medium speed for 2 minutes. Dough should clear the sides but stick to the bottom. If it is too sticky, add 1 tablespoon of flour at a time. If too dry, add 1 tablespoon of water to dough to adjust. 2. Turn the mixer on again and mix for 3 minutes. Take the dough out and place on the counter. Remember that 1/4 cup of flour that we reserved? We’ll use it now. As you knead the dough by hand, incorporate more flour as you need. 3. Place this dough in a large lightly oiled bowl (I use Pam spray). 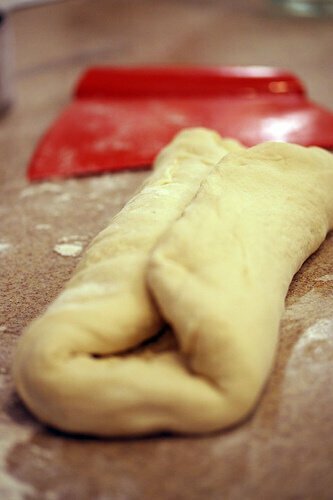 Turn dough over so that all sides have a thin coating of oil. Cover with plastic wrap and set in warm place for 1 1/2 hours to let rest and rise. Dough should almost double in size. While the dough is rising, about 1 hour into the rising stage, preheat your oven to 450F and place your pizza stone, inverted baking sheet or covered cast iron pot into the oven to heat up. 4. After the dough has risen fully, punch dough down and form back into a ball. 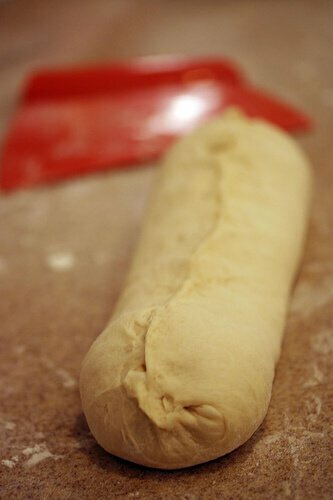 Poke your finger on the surface – the dough should give into the pressure and slowly creep back up. Now do a little “karate chop” lengthwise down the middle of the bread and stretch out the long ends again. Fold over in half. The karate chop helps get the middle tucked inside. Pinch all sides shut. This is important – you want to make sure that all ends including the short ends are pinched tightly to create a seal. This allows the bread to rise & expand up and out evenly. If the bread looks a little lopsided, you can try to fix it by letting it rest 5 minutes and gently stretching it out again. Just don’t knead the dough again – you’ll pop all the beautiful gas that took 1.5 hours to create! 6. Turn the bread over so that it is seam side down. Cover the loaf with a damp kitchen towel. Repeat with the other dough ball. Leave the loaves to rest on your well-floured pizza peel or cutting board for 30 minutes. After resting, take a sharp paring knife and make 3-4 shallow, diagonal slashes on the surface of the loaf. This allows the steam in the bread to escape so that it expands evenly during the baking process. 7. When you are ready to bake, remove your baking vessel from oven. Carefully slide the gorgeous loaf into or onto your baking vessel. I like baking one loaf at a time. The most important equipment to have is an instant read thermometer to measure temperature of the bread. You can probably fit both loaves on it at the same time if you wish. -> Get a 1/2 cup of water ready next to the stove. Open the stove, put your bread in the oven and throw the water on the oven floor. Immediately close the oven door. This creates your steam. -> Bake 20-25 minutes. Check temperature of the bread – internal should be 190-210F. Remove and let cool before cutting into it.